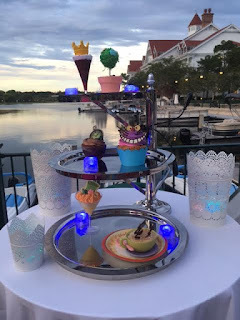 Anyone who knows me knows that Alice is my favorite Disney character so when I read a small article about Disney’s Grand Floridian Resort having an Alice in Wonderland themed party during Wishes I knew it was something I had to see for myself. My husband, who generally thinks I am a little on the obsessed side when it comes to Disney, only slightly rolled his eyes when I went out Tuesday to get my nails done and had them painted Alice style in preparation for an event I really knew very little about. I am going to start by saying that the Gone Mad Party is probably one of the best kept secrets in Disney because when we got to the Grand Floridian we had to ask 3 different Cast Members before one knew what I was talking about and then it required a phone call to see if the event was still happening. The party is a test for what could possibly happen at a few other resorts and while it was only originally supposed to run in June it was extended through July and then as popularity slowly grew they decided to run it through Labor Day. As of now that is the word but definitely be on the lookout for it, or something similar, to continue as the CM that I spoke to said that in the last 2 weeks the attendance has really picked up. 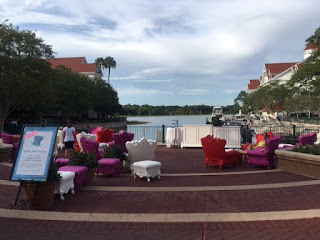 It is located in a great spot right in front of Gasparilla’s and the arcade right on the water where the boats are and facing Cinderella’s Castle. The spot was smaller than I was expecting but there was a nice breeze and a great view and a few people milling around so we settled into some chairs and got some drinks from the pool bar while we waited. The party runs from 8:30-10:30 but around 7 the Cast Members started setting up laser lights and speakers. They set up a table of “Gone Mad Photo Op Props” which was filled with all different hats and ears to try on and take photos with. My son and I had some fun trying them on and taking selfies. The desserts came out as well as the drinks and once they were set up people immediately got in line so it started a bit before 8:30. 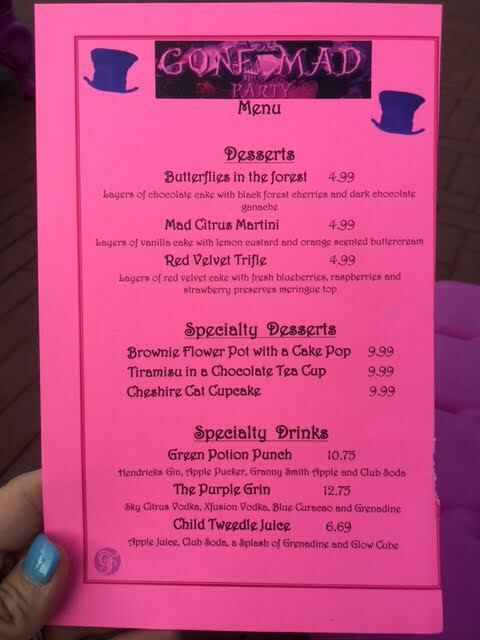 The menu is short but sweet with some gorgeous and delicious sounding and looking desserts and really fun themed adult beverages (Who goes to Disney and doesn’t drink?!?!) along with a child’s punch option. 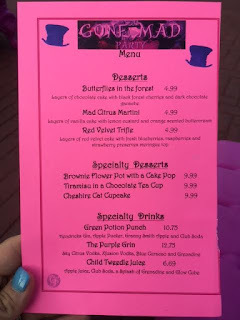 Since I wanted to do some “research” I got in line and bought a Butterflies in the Forest, a Red Velvet Trifle, the Tiramisu in a Chocolate Tea Cup and a Cheshire Cat Cupcake. (Just as a reminder, I did have my husband and 2 kids with me to share with!) 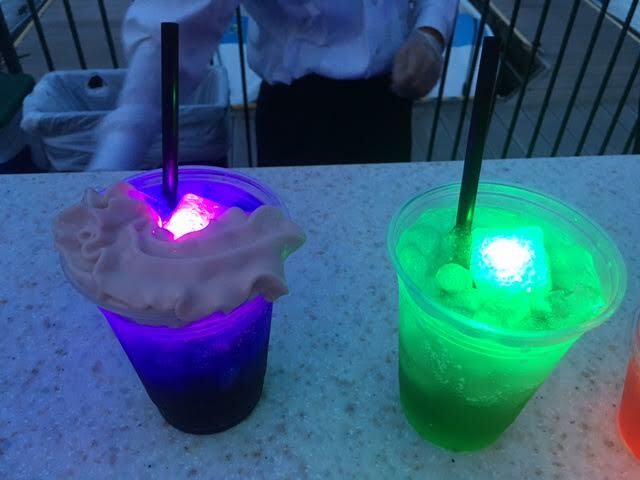 I also got both the Green Potion Punch and The Purple Grin. We got 4 spoons and dug in, trying them all, and everything was top notch Disney quality and deliciously decadent. The adult beverages were really fun and both included glowing cubes and were very strong. Alcohol at Disney is not cheap but they do give you your money’s worth for sure when they mix their drinks! The Cast Members turned on some Radio Disney type music and got a fun dance party happening a few times and had people up and moving to dances like the Cupid Shuffle (which she Disneyfied and it was super cute! ), YMCA, the Electric Slide and the Cha Cha Slide. The party was definitely worth checking out and even the bit of rain that came didn’t put a damper on everyone’s good time. It rained for a few minutes and then stopped just in time for the 10PM Magic Kingdom’s Wishes Spectacular. 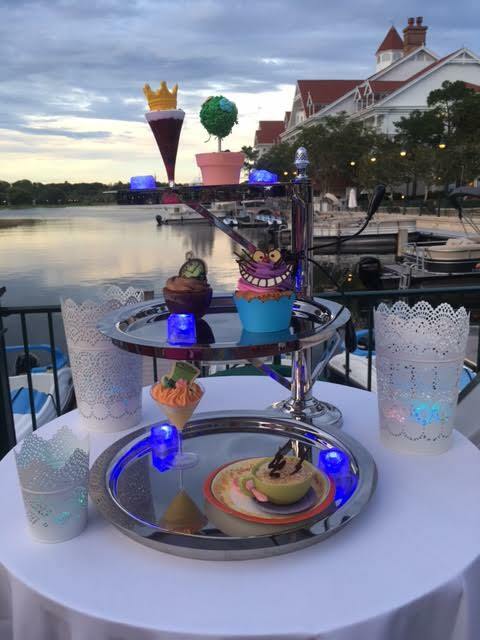 They piped it in directly to the speakers in front of us so it was just as if you were over in the Magic Kingdom, but instead you were sitting in a comfy chair with a delicious snack and an amazing mixed drink, which you cannot buy in the “dry” park. 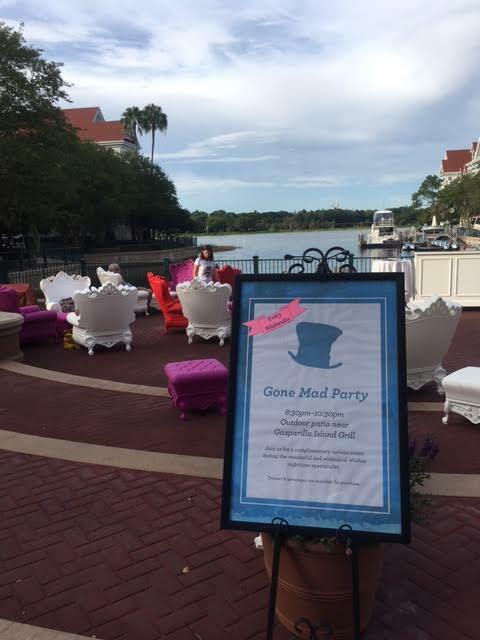 The Gone Mad Party is happening at Disney’s Grand Floridian Resort Wednesday nights from 8:30-10:30 in front of Gasparilla’s now through Labor Day. If you can squeeze it in to your schedule on your upcoming Magical Vacation I highly recommend it. 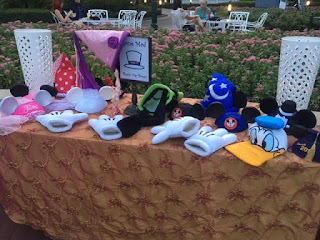 You do not need to be a Grand Floridian Resort guest to attend.